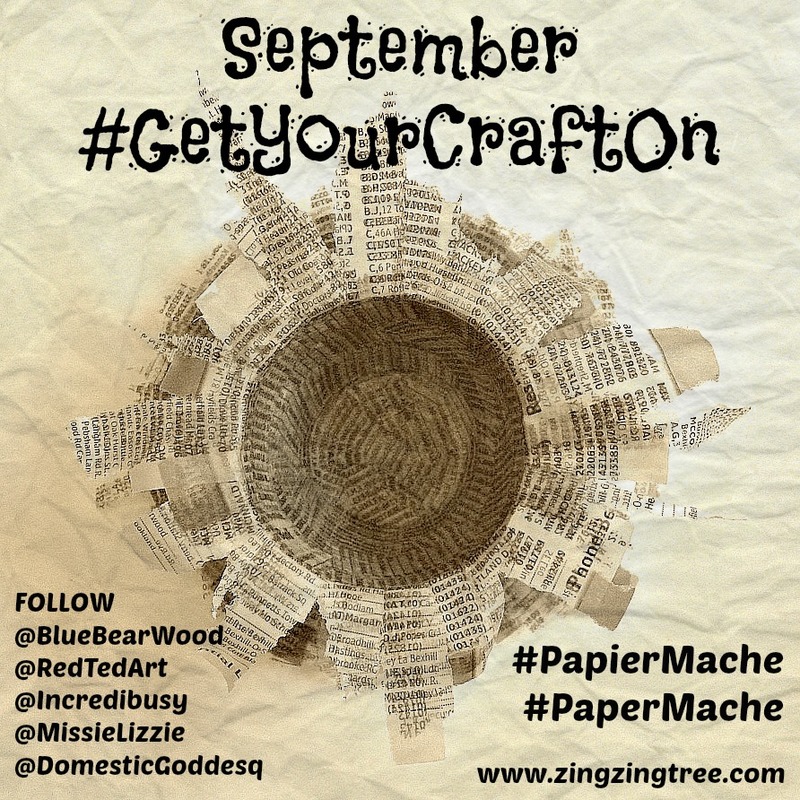 It’s my turn to host this months #GetYourCraftOn and I’m excited to announce that the theme is Papier Mache. Papier Mache or Paper Mache is one of my favourite craft materials. It’s cheap, easy to use and can be used to make an amazing array of crafts. The basic materials are paper and an adhesive paste that are combined together in layers, as a pulp or as a mixture of pulp and paper layers to craft and shape jewellery, bowls, pictures, decorations, cards, sculptures, puppets, masks etc. It’s use is immense and only limited by a crafter’s imagination. So what paper to use? You want a nice fibrous paper such as newspapers (broadsheets are better than tabloid but both work well), old telephone directories, tissue paper (check it’s non bleed), kitchen roll, toilet roll can be used although it’s better for pulp. I’ve even torn up old computer manuals. Oh and egg boxes are also great for making pulp. Always tear your paper as you want the fibrous rough edges to bond together. You can use strips or small squares. Just make sure you tear the pieces to fit the papier mache structure. If you find the paper isn’t lying flat it’s probably to big a piece to make it smallers (unless of course you want a rough finish). Pulp is perfect for sculpting and making creating smaller relief structures. It can also be used to make the underneath shape that then has papier mache layers placed over it. If you don’t want to make your own pulp (blog post to come soon) you can buy it already made up and all you need to do is add water. For small layered papier mache projects (such as covering a polystyrene ball) I often use a pva/water paste. The pva glue is diluted with water (the amount of water varies depending how strong your pva glue is) and this paste is used to cover the paper layers. I tend to use a thick strong sticky pva glue and will water it down with a 50/50 water glue ratio. Larger projects need a more economical paste and for this I tend to use cellulose adhesive (blog post to come soon). Cellulose adhesive is cheap and a little goes a long long way. It’s just like wall paper paste without the fungicide so perfect for using with children and very easy to make up. A teaspoon of it will be more than enough to cover a couple of large balloons. Any left over paste can be stored in an airtight container in the fridge for a few weeks. Flour and water paste is another great adhesive for using in papier mache . All you need is household flour , water and a pinch of salt. I use a mix of 1 part flour to 4-5 parts water. You have to gauge the water by trial and error. How much water depends on your climate, the type of flour used and what time of year it is in my experience but as long as you add the water bit by bit it’s hard to go wrong. How much water is added also depends on how thick you like your paste. You either need to use hot water to mix in or cook your paste over a low heat. For more detailed instructions look here. Share your Papier Mache projects on instagram and if you wnat to sahre the papier mache love even further share it on Google+, twitter, facebook etc using the tags #GetYourCraftOn #PapierMache #PaperMache. You don’t even need to share a finished project. Show us images of your project through different stages. Share images of other peoples work (but get their permission first). Do and check out what others are making and give them some support and if you have a blog add any Papier Mache Craft posts to the linky below (new and old). Oh and don’t forget to follow the rest of the gang listed in the image above on instagram @RedTedArt, @Incredibusy, @MissieLizzie and @DomesticGoddesque.